Roundtable Contributors: Elizabeth Caran (Outlander Travel), Princess Fee (DF’82), Estelle Hallick (This Happy Place), Melissa Loflin (Makin’ Memories Photoblog), Alan Mize, Jeremy Morrison (Spins The World), Melissa Sue Sorrells Galley (Mouse on the Mind), Blake Taylor (BlakeOnline.com), Andrew (Disney Hipsters Blog), and yours truly. Ahoy there! Hopefully most of you escaped Hurricane Sandy’s wrath unscathed over the past couple of days. (Things remain pretty chaotic up here in New York.) It seems a magical vacation aboard the gorgeous Disney Fantasy couldn’t escape the stormy weather either. Various videos (1, 2 + 3) have been uploaded online showing damaged windows and stores/eateries rocked by the extra large waves no guest signed up for. Others on a 3-day voyage on the Dream experienced horrible seasickness and boredom due to lack of activities and sunny weather. They were dismayed to learn that Disney would only offer a 25% discount off their new cruise for the inconvenient weather. Knowing firsthand how diligent the cruise line’s magical maintenance crew works, I’m not surprised things were swept up on the Fantasy before the next cruise was underway. It is unfortunate that some routes had to be altered because of the storm, including the scheduled stop to gorgeous Castaway Cay (Disney’s private island) in the Bahamas. No word yet if the island suffered any damage, although Disney did elect to have some of the full-time staff jump on board during the storm. It’s astonishing to read some of the guest accounts from this weekend’s voyages on the Dream and the Fantasy. But, folks need to know that hurricane season runs from June to November and, unfortunately, this could mean having to battle some miserable weather conditions. Future cruisers need to take caution and remain aware of the weather and the possible risks. On the other hand, I’d hate to think that a trusted crew made some unsafe decisions just to follow a strict cruising schedule. One thing we know for sure: all guests returned safely. The doors of the Adventurers Club and the Comedy Warehouse may remain firmly closed, but the entertainment has moved out onto the streets of Pleasure Island with the introduction of Living Statues. These lively artists alternately stand perfectly still and interact with delighted(?) guests from their pedestals, springing to life and posing for photos. While I love Downtown Disney—especially at night—I personally hope I never run into the creepy mimes on my way to Cookes of Dublin. One of the most underrated festivals will soon be returning to Downtown Disney, in Walt Disney World. The Festival of the Masters will be at Downtown Disney from November 9-11, and is a great time to visit the area, if you can. The Festival celebrates all kinds of art and design, from painting, to live music, sculpture to photography. Whenever I have been in WDW during this time of year, I always make an effort to spend some time taking in the Festival. For this first time this year, there will also be what is described as an Emerging Masters area, where up-and-coming artists can showcase and compete. In my opinion this sounds like a fantastic idea – what a great place for those starting out to make a mark, and to gain some well-deserved publicity. It can only benefit the Festival of the Masters in the long-run. The Wreck It Ralph meet and greet opened a few days ago at Hoolywood Studios, and though this isnt the largest news of the week (im lookin at you Lucas!) it does mark a deccidedly unique change for the company. Meet and greets character spots of the past have been supplied with little or no forethought, just a place to appease children with somewhat bland theming. Wreck-It Ralph and Vanellope von Schweetz from the new Disney Animation film Wreck-It Ralph now have a character meet & greet at Disney’s Hollywood Studios. The duo began visiting with Guests on Sunday inside the Magic of Disney Animation building, as is the tradition for almost every new movie from Disney or Pixar Animation. Pooh was wrecked off the scene (that must have been traumatic), though Sorcerer Mickey and the Incredibles remain. Every new character greeting that rolls through the Magic of Disney Animation is, essentially, there to introduce Guests to these unfamiliar characters and to sell the movie, and as such the sets are usually quite elaborate, and the one for Ralph and Vanellope is no different. It depicts Game Central Station, a location in the film where video game characters can travel to other games. 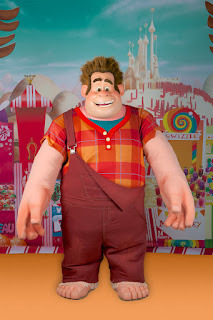 Ralph (he’s huge—we’re talking Sulley-size huge!) is native to Fix It Felix, Jr., circa 1983, while Vanellope is from a 1997 racing game called Sugar Rush (both being fictional, Disney-created titles). Ordinarily Ralph and Vanellope could be expected to stay at Hollywood Studios until the next Disney or Pixar release. However, since the next of those is Monsters University this summer and Mike and Sulley already have a meet & greet elsewhere in Hollywood Studios, Ralph and Vanellope could stick around at least until next November, when Disney Animation will release Frozen (and even longer than that if those characters end up in the Magic Kingdom, with Frozen being a Hans Christian Anderson fairytale). Wonder what Ralph would do if you called him the Hulk? Jambo, everyone! Although I haven't seen a lot of press on it, this past week brought a very exciting development for me and especially for my six-year-old son. The much-anticipated integration of zebras into Kilamanjaro Safaris has finally come to fruition! Last week on Tuesday (October 23), zebras began to be gradually introduced into their new environment on the safari. There are a total of twelve zebras that will be integrated into the attraction from their previous home at the Animal Kingdom Lodge, and when we took an early morning safari on Wednesday (October 24), we were treated to seeing about eight of them. They are in a habitat just before the old scene with the trucks and audioanimatronic baby elephant used to appear. It seems to be a very small habitat for so many animals, but I am no expert and I'm not sure it's as small as it seems. Guest services told us there were a total of twelve, but they were unable to tell us how long the integration process will take or if all twelve will normally be out on the hillside. During our morning safari, there were three caretakers in the habitat obviously monitoring the beautiful animals as safari trucks rumbled past. The zebras were calmly grazing on the hill and were close enough that my son, who loves zebras, was beside himself with joy. So much so, that I neglected to take any photographs. We took the safari again around noon only to find the habitat empty. But guest services told us that the integration was in full swing, and if our first experience was any indication, they will make a wonderful addition to this already fantastic attraction. 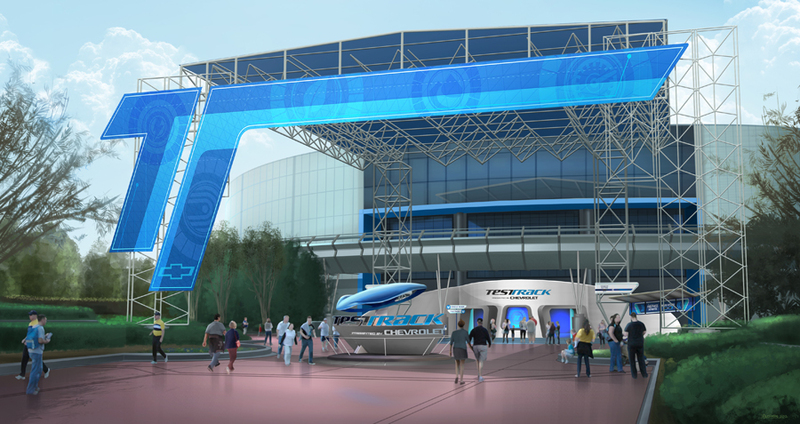 It was announced on Sunday that at some point this week, Test Track’s new exterior will be revealed. Based on the artist rendering found on the Disney Parks blog the new exterior is presenting a newer, more modern, sleek, and futuristic attraction, just right for Future World. Look closely and you’ll catch a glimpse of the old World of Motion logo. Is this a sign of some sort? The new Test Track will be a 6 person SimCar where guests are able to design their own ride vehicle. But how is this going to work? Six people designing one ride vehicle? I know I’m not imagineer material but I can’t wrap my brain around what this will be like. Back to that World of Motion tie-in on the exterior signage. On the new Test Track guests will exit the ride to look into the future of transportation. Sound familiar? I never got to experience World of Motion but from what I have read its finale tried to predict the future of transportation; will this new finale be similar? I’m curious to know but we’ll have to wait until December 6th. I’m hoping for some soft openings during Thanksgiving when I’m there. It was September 20, 2011 when Disney announced their partnership with James Cameron to bring the world of Avatar to Disney's Animal Kingdom. Since then, there has been a lot of silence coming from Orlando about the details of "Avatarland" and exactly what this expansion meant for the theme park. While there is still no official word coming from the Disney powers that be, purported blueprints surfaced late last week that show potential attractions for the world of Pandora and the buzz for Avatarland, both positive and negative, is definitely back. In the interest of full disclosure, I have not seen Avatar, so I can’t speak to the merits of the film. Having said that, I will admit that I was pretty shocked by the announcement and my original thought was that this decision was a knee jerk reaction to The Wizarding World of Harry Potter at Universal Studios. However, I chose to reserve judgment until more information was released. Now that we appear to have that additional information, I am cautiously optimistic about the future of Avatarland. Based on the information that has surfaced, there are two new attractions being planned. One will apparently be a 3D film in the style of Soarin’ and the other will be a boat ride through Pandora. While neither of those descriptions is exactly groundbreaking, these blueprints are probably far from final and there is still a lot of time for these plans to grow. Despite the fact that it would be considered the smaller of the two attractions, I am most looking forward to the boat ride attraction. The one common opinion I have heard regarding Avatar is that it is a visually stunning film and I am excited about the possibility of riding through a visually stunning land of Pandora. If there is one thing that Disney Imagineers know how to do, it is to fully immerse you in an environment and make you feel like you’re anywhere but central Florida. Add in the fact that James Cameron, who is known to be a severely detail oriented director, will be working with Joe Rohde, the mastermind of Disney’s Animal Kingdom, and I can see how Avatarland could be absolutely breathtaking. There is still a lot of time before anything is definite, so plans could change. However, with the names associated with this expansion and the information that surfaced last week, I think there is a lot of potential for Avatarland and I look forward to seeing exactly what Disney does with Pandora. With a groundbreaking announcement, Leia was transported to a place affectionately called the Disneyverse; with that she became the newest and most famous Disney Princess to date. Sorry, Cinderella. Mickey, it seems, had a spare $4.05 billion dollars burning a hole in his famous red trousers. He didn’t buy a luxury car, or a dream vacation. Instead, the Mouse made the most important purchase in entertainment history. 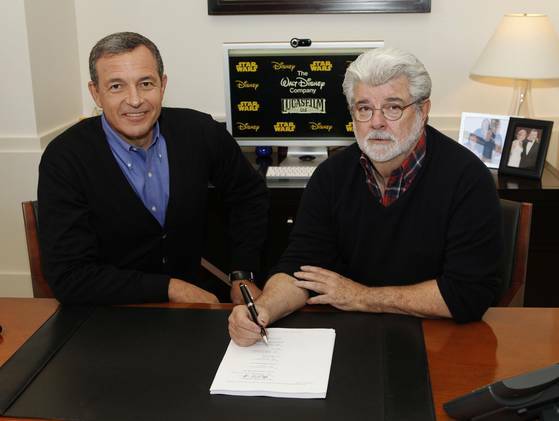 After signing the check, the House That Walt Built was the proud owner a shiny new Lucasfilm. It was a purchase that included I.L.M. and the entire Star Wars Empire. Twitter suffered a Death Star-like explosion of fan-boys waxing about the promise of a new Star Wars flick by 2015. Which, unless they’ve been filming in secret, isn’t likely. The Tatooine faithful began passing the judgment-saber before the ink on the contract dried. Even if Disney put forth an enormous effort, they could not possible dilute the mythology of Star Wars more than George Lucas already had. In fact, after less-than-stellar outings in Episode 1, 2, and 3, perhaps the fresh minds at Disney are exactly what Star Wars needs. Then there are Disney Parks. Likely, this will be the official kiss-of-death for Avatarland. Why answer to the notoriously difficult Jim Cameron when everything Star Wars is now under your banner? This may also silence the Carsland at Disney World rumors. With so many characters, stories, and sets to now work with, it seems redundant to water-down the Disney brand and clone existing parks. Disney World’s New Fantasyland – a $400 million project - became an old memory, overtaken by visions of romping through a galaxy far, far away. Not a lot of people give Ariel a second-thought when the chance of strolling through a hyper-themed Star Wars Land is now a very real possibility. From a monetary standpoint the move is brilliant. This will certainly attract a new breed to cruise through the gates of Disney Parks worldwide. There is a lot to get excited about with Disney in the Millenium Falcon’s cockpit. New characters, new stories, new movies, theme parks, and yes, toys. Plenty of toys. To many fans, Disney is the new Dark Side. And Lucas finally gave in and signed up. I don’t believe it will be hard to get the nay-sayers to follow suit. 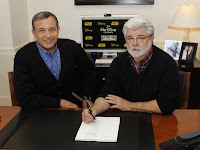 What does Lucasfilm and Disney mean to me? Well, as I told my wife on Tuesday, “If only they could get their hands on DC Comics and Batman, I’d be all in!” Yeah, that’s not likely, but anything seems possible these days. In terms of Walt Disney World, this announcement offered me a seemingly endless scroll of possibilities and questions. Here are just a few of my favorites. Is Princess Leia going to start appearing on stage next to Cinderella, Aurora, Snow and Belle? It’s unlikely, but the idea is tantalizing. Adding a shoot blasters first, ask questions later sci-fi princess to the animated assortment of princess now gives boys a reason to consider venturing in to princess territory, although I suspect it might be a while before we see a meet and greet character outside of Star Wars Weekends. Is Tomorrowland and/or Avatarland set-up for renovation from far, far away? I don’t suspect that we’ll see massive park revamps in the style of Star Wars for a while, but it is worth considering, and is probably likely as time goes by. Remember, The Little Mermaid attraction had been developed, shelved, and reworked since 1989, before it finally crashed upon the shores of Fantasyland in 2012. Why have so few mentioned Indiana Jones?!?! The other side of the Lucasfilm-Harrison Ford coin is, truly, just as important to Disney now. A Sorcerers of the Magic Kingdom type game featuring Indiana Jones in Disney’s Animal Kingdom? You bet! Avatarland becoming a hotbed of Dr. Jones adventures? Why not! The chance to see more of Henry Jones Jr. in the parks of Walt Disney World, aside from a stunt show, excites me as much as the possibilities presented by the Star Wars side of the acquisition. In short, Lucasfilm opens many, many doors for Disney and Walt Disney World, but there are also possible pitfalls from moving too quickly and not holding the brands up to their highest potential. I am as giddy as any fanboy who has ever whooshed a lightsaber this week, but to borrow a line from another recent Disney acquisition, with great power comes great responsibility. Where do you think you are, Disney World?